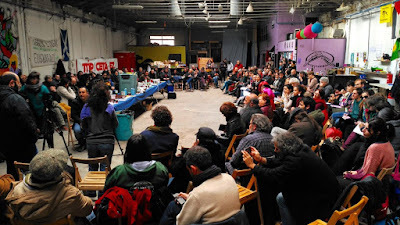 I'm afraid this post is out of order, but as the first post was far from clear, it seems necessary to explain further what this MAC 4 meeting in Madrid on municipalism, self-government and counterpower was intended to be about. In the first post on MAC 4, I referenced the disappointment many in Spain are feeling with the city governments they helped to put into power. In a pre-conference article posted to El Salto, Alberto Azcarate spelled it out, and I condense points from that below. Note that these MACs are not meetings about municipalism per se, like academic conferences or meetings of elected officials and their governments' functionaries. The MAC meetings are intended to function as “an observatory and a critical monitoring platform” for the “change councils” to ensure that they comply with the mandates they received from the social movements that stood behind them from the beginning and voted them into power. 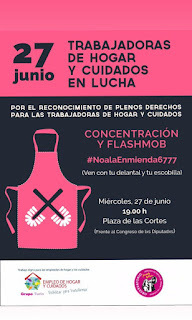 The next wave will again be driven by the movements, to “reconstruct the mobilizing base.” They look to the milestone of the the feminist strike of 8M, the national mobilization of pensioners, the “everlasting PAH – a collective star of movementism,” and the new movements for housing vs. gentri- and touristi-fication, the unions of precarious and domestic workers, and of sin papeles., among others. The movement groups which made such efforts to take Ahora Madrid and Manuela Carmena to the municipal government today feel cheated. Their issues have been forgotten. Now, as Ahora Madrid and Carmena look to “the middle strata of social democratic” voters in Madrid, “the sinuous drifts of institutional politics begin to promote a silent dispute over the integration of future candidates and candidates in electoral lists.” MxM: Madrid por el municipalismo convened the final assembly of the MAC 4 (which I did not attend), where these issues were addressed.